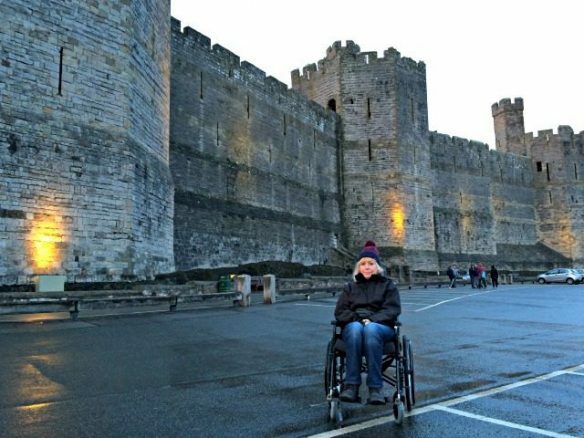 It’s not unreasonable to assume that small Welsh towns are difficult to navigate in a wheelchair, many have thin or non-existent pavements and, of course, there are the hills! But, if you plan in advance and prepare to be flexible Welsh towns are actually quite accessible for wheelchair users and the less mobile. As usual, we were suffering from chest infections and didn’t want to travel too far. North Wales is on our doorstep so we packed the car and went on a mini road trip! 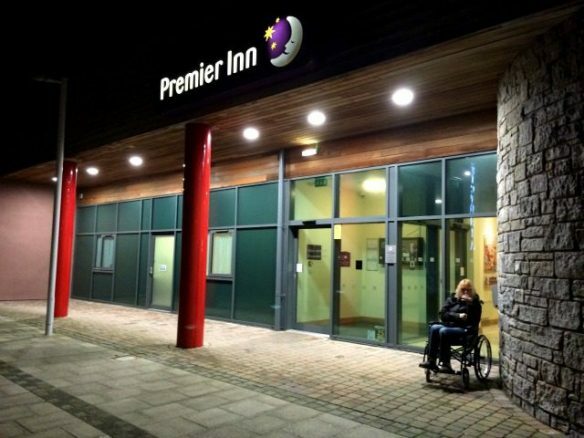 We checked into the Premier Inn in Caernarfon which was to be our base for the next three days. 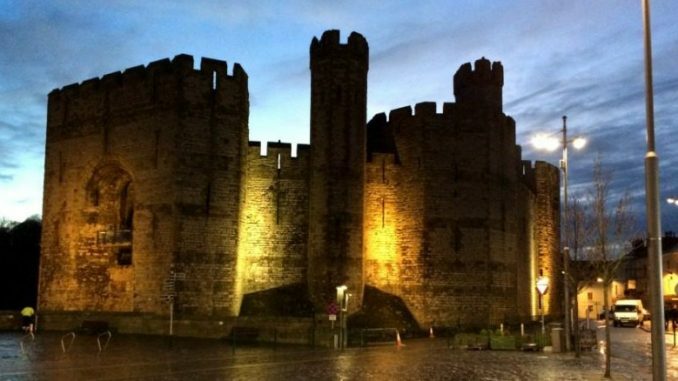 Situated on Victoria Dock (Doc Fictoria) the hotel is an ideal location for exploring Caernarfon and surrounding towns. Regular readers will know we champion Premier Inn because it’s a safe option. We know in advance which facilities are available and now with free Wi-Fi, it just suits our needs perfectly. One surprise we did get when we arrived at the Caernarfon Premier Inn was the humongous room (117), it was bordering on being a suite. Weary and feeling like poo we opted for dinner at the Table-Table restaurant which is across the way from the hotel. If you’re travelling on a budget, this restaurant has a meal deal which is £9.99 for two courses or £12.99 for three. 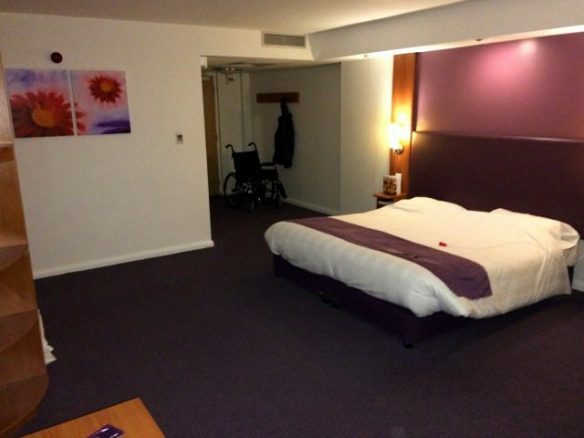 The Premier Inn, restaurant and surrounding dock area are all wheelchair accessible. There are ten disabled parking spaces in front of and to the side of the hotel so parking shouldn’t be an issue, I have no idea why the hotel doesn’t promote this? Food and service at Table-Table were great and they were happy to move a few tables around to accommodate the wheelchair. If you visit you could ask the hotel to ring ahead for you and book a table; we didn’t! It was an early start for me on our first full day in Caernarfon. Neither of us had slept properly, poor Bridget had been up all night coughing and I was awake with her. I didn’t feel like getting up early but I did because I hate staying in bed when I’m awake. I thought I might be able to get a few photos of the marina as the sun came up but sadly not. Bridget doesn’t do breakfast and I’m a greedy pig when it comes to a full English so we very rarely have breakfast together. When Bridget (eventually) made it out of bed we set off to find a supermarket before I collapsed from starvation. We choose supermarkets to eat because they are generally accessible in a wheelchair and cheap. We didn’t need to search very far because there’s a Morrison’s virtually next door to the Premier Inn, I was able to feed my face to the point of bursting for under a fiver. Fully fuelled we took a drive over the Menai Straits to the Isle of Anglesey. We’ve visited Anglesey before but it was during a dark time in our lives so we didn’t have the chance to enjoy it or appreciate the beauty of Anglesey. Now that I’m a blogger I’m a pain in the arse because I want to stop every two minutes to take photos. It’s probably dangerous hitting the brakes and pulling into the nearest lay-by but needs must and this is exactly what happened when I caught a glimpse of the suspension bridge and fish farm. The Menai Suspension Bridge is one of Thomas Telford’s masterpieces and was completed in 1826. The bridge spans the treacherous fast flowing water between Anglesey and mainland Wales. I can’t remember which programme I saw it on but I remember the Fish trap being mentioned. Although the trap is far away in the picture you can still see what an ingenious design it is. Fish Trap on Menai Strait. It basically allows fish to swim in during high tide then traps them behind a wall at low tide which I think is kind of clever! We moved onto Beaumaris and parked near the sea front. There’s a £3 charge but that’s for all day so not expensive. We’d been there less than five minutes when the wind and rain arrived so I took some shot’s in a hurry and jumped back in the car. There’s was no way Bridget could be in the wheelchair in that weather so she just sat in the car laughing at me trying to get usable pictures for the blog! 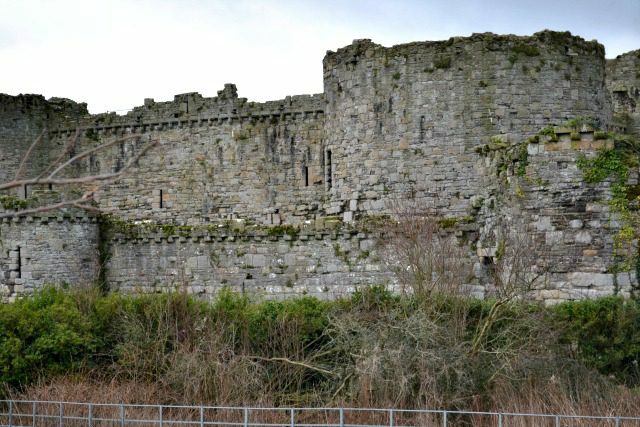 I knew I needed pictures of Beaumaris Castle so I drove over to the car park and took these through the fence. I’m sorry we couldn’t take a walk through Beaumaris or go inside the castle grounds but on this day, it just wasn’t worth it for Bridget. Whilst messing about on the seafront I’d spotted a Pier in the straits, I assumed it was Bangor Pier so set off to take a closer look. This meant leaving the rest of Anglesey for another day but for some odd reason I’ve developed a liking for piers so didn’t mind? We didn’t stop in Bangor itself just headed straight to the pier. Upon closer inspection, it’s named Garth Pier but what’s in a name? Garth Pier in Bangor, North Wales. 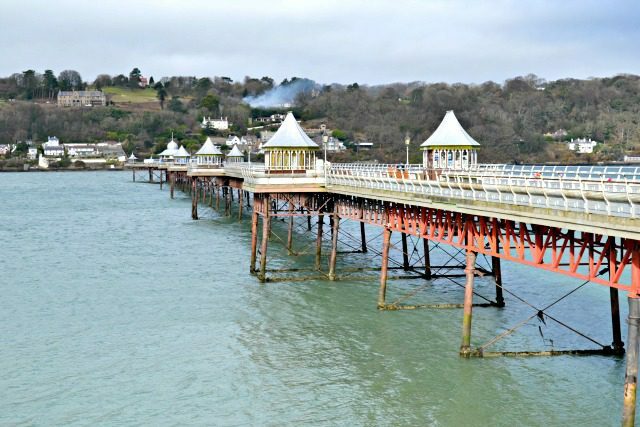 This gorgeous grade ll listed pier is the second longest in Wales and the ninth longest in Britain. Facts aside it’s a great place for an accessible walk. Again the weather prevented us from taking the plunge and walking it but this is one we’ll return to in the future I’m sure. It was time to head back to the hotel for a well-earned rest which we did but not before capturing this lovely boat scene. Boats moored outside Bangor harbour. After a power nap and dinner, the coughing returned with a vengeance so we settled in for another sleepless night! Do you know when you can hear rain on the window but try to convince yourself it’s not rain because that would ruin your day, well that’s what our third day in Wales was? We sat in the hotel room for hours listening to the constant pitter patter hoping it would go away. It did stop in the late afternoon so we donned our warm gear and headed off into Caernarfon. We had planned on walking along the quay from the hotel but it was too windy and the threat of more rain hung over our head. 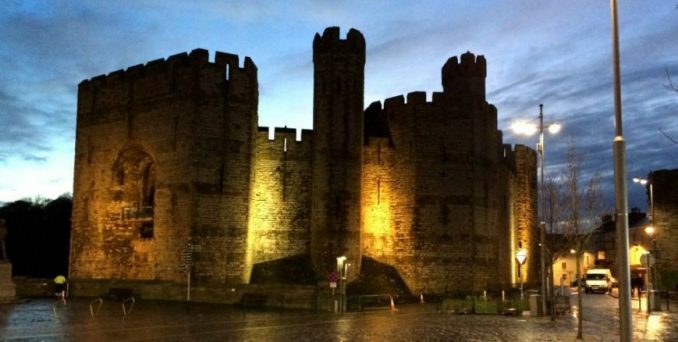 There’s plenty of parking at the foot of Caernarfon Castle for a fee and some free parking in front of the harbour building. If you stay at the foot off the castle it’s relatively flat and easy to push a wheelchair along the harbour but if you want to go up into the town centre it’s a bit more difficult. There’s a steep incline which could be too much for most, I managed it but it wasn’t easy! Castle from the main square. Once at the castle, they’re building an access ramp on the town centre side so this seems to be the best option. 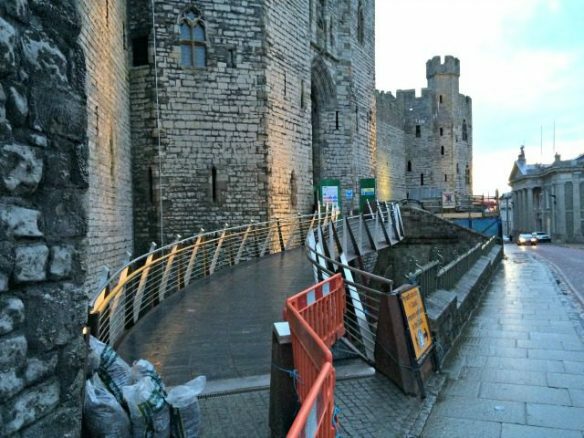 Building an access ramp on Caernarfon Castle. We didn’t go inside the castle as it was too late but I did get some nice photos. The castle is an imposing structure worthy of its world heritage status and it defies belief it could be built with such precision so long ago. We’d been given a tip off about a fish and chip shop called Ainsworth’s in Bridge Street so off we went in search of the best fish and chips in Wales. There are lowered kerbs and flat slate surfaces in the town centre but again there are inclines which could cause problems for some. 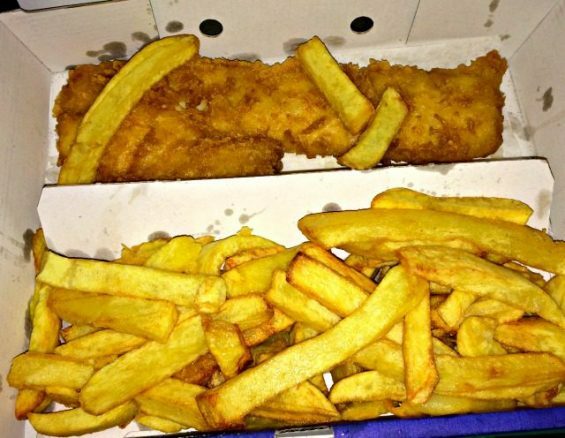 Best Fish and Chips in Caernarfon. 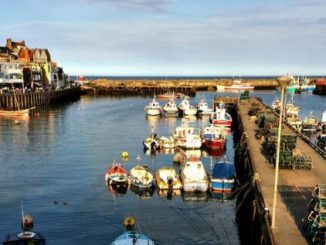 It’s approximately a five-minute walk from the castle to Ainsworth’s but if you appreciate a tasty piece of Cod and proper chips it’s worth the effort. Our trip to North Wales went quickly which is always a good sign of enjoyment but I wasn’t done yet! There were two more places I wanted to check for accessibility… Llandudno and the Great Orme. On the way home we did a little detour into Llandudno and without a word of a lie, this is mobility heaven. 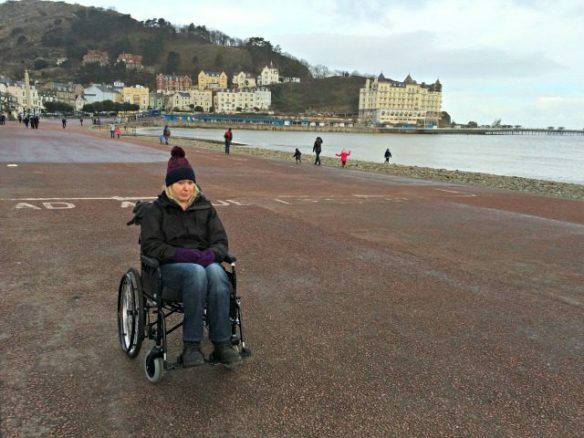 Honestly, Llandudno is the most wheelchair friendly town in Wales. It even has a mobility superstore on the way into the town! The promenade and Pier are long, flat and easy to walk. 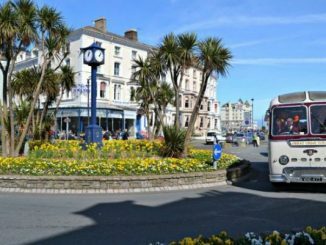 There are plenty of hotels on the seafront with access ramps and the town centre is not only pretty but very accessible. She’s not miserable just scared of seagulls! 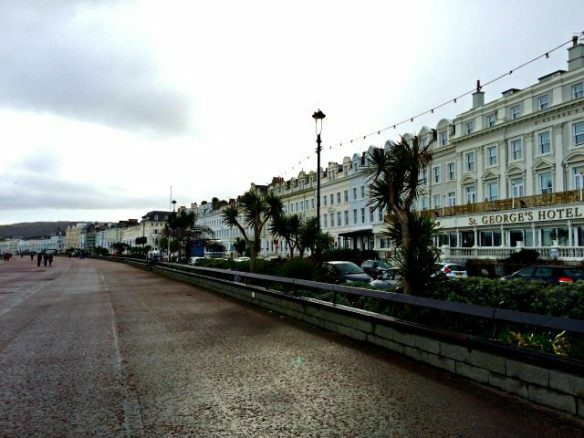 I could imagine spending a few days in Llandudno relaxing and watching the world go by. Our last port of call for this trip was the Great Orme. It would be easy to describe the Orme as a big piece of limestone rock stuck on the end of Llandudno but that would be too simple. It’s been much studied by archaeologists and geologists but it still hasn’t given up all its secrets. Being honest I felt a little bit jealous of the people walking up it but what can you do there’s no way I could push Bridget up it. The road up is a toll road and costs £2.50; it’s a stunning drive up with plenty of scenic stops en route. Once on the summit, you’re rewarded with spectacular views of Wales and the Snowdonia mountain range. You can see from the picture there’s a cafe on top of the Orme; I pushed Bridget up the very steep path only to find it was shut when we got there! There’s a road to the top from the car park which I think you can drive up but there was no one available to ask so I didn’t risk it. If you know if this is acceptable please let me know in the comments. 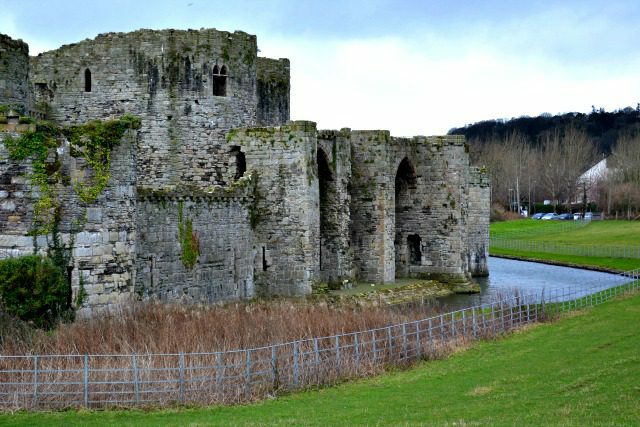 North Wales is a beautiful part of the United Kingdom with its castles, mountains and beaches. From our point of view, it’s also very accessible. We’ll certainly be planning more trips and without hesitation, we’d recommend you visit North Wales soon! 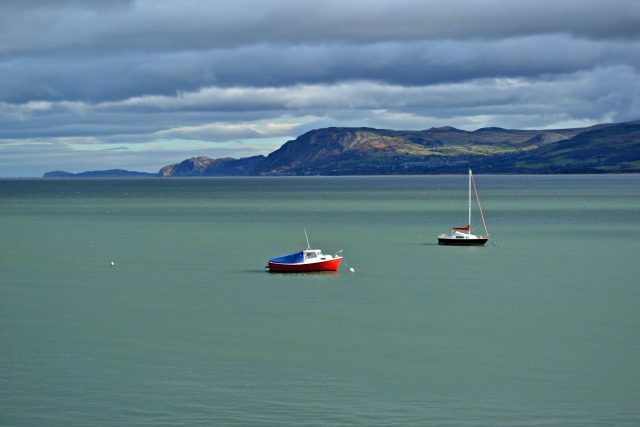 Have you been to North Wales or are you planning a visit? Where’s your favourite part of North Wales? 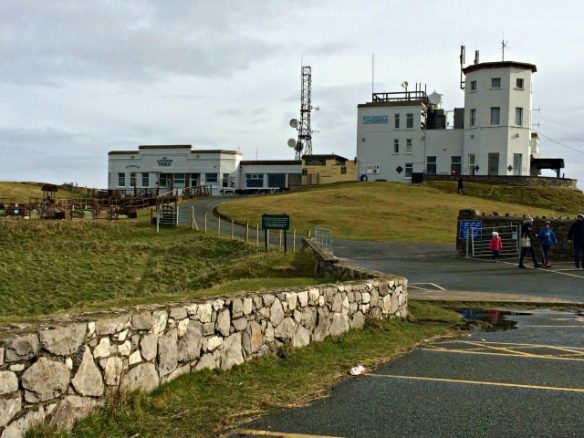 The last time I drove up the Great Orme we went to the very top where there is another car park and cafe bit. You have to pay for the car park, even if you’re disabled. I also found a way of driving up there avoiding the toll road but the road itself is rather spectacular and well worth it. We go to North Wales most years as it gives me such vivid memories of my childhood. I was dragged up in Seacombe. 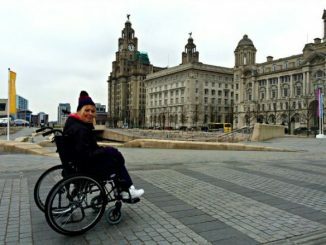 As another wheelchair user I’d be happy to pass on any more information about the places we’ve visited. Thank’s Stephen, I didn’t know about the other car park at the top, that’s really useful. I love the walk along the Mersey up to New Brighton, it’s a great way to blow the cobwebs off any time of year. We’d love to hear about the places you’ve visited, if you fancy writing up a post I’d be more than happy to publish it on the blog.